From creamy avocado hollandaise to fluffy carrot waffles, here are 11 fantastic breakfast recipes that incorporate spring ingredients. 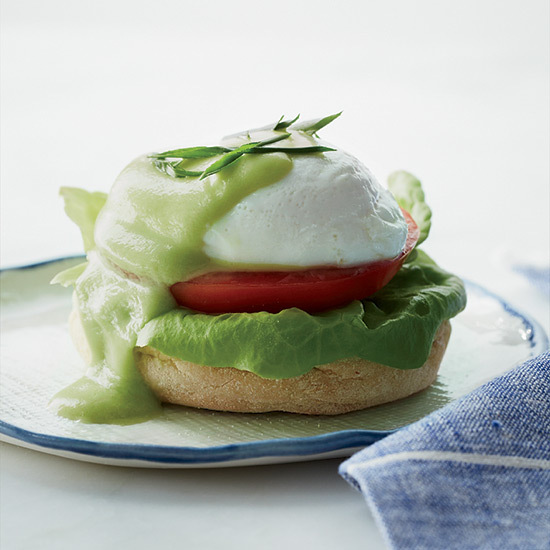 Upgrade eggs Benedict with this terrific take on hollandaise, made with creamy avocado puree. This incredible tart features spring asparagus and custard flavored with Parmigano-Reggiono cheese. Gail Simmons's healthy, vegetarian egg dish was inspired by her time in Israel. These fluffy, slightly chewy waffles are completely gluten-free. Serve this fantastic potato potato pancake with creamy, scrambled eggs or smoked salmon and sour cream. What's the secret to this superfast, puffy omelet? Beat the egg whites until they form soft peaks, then fold them into the yolks. Combine carrots, apples and homemade flax seed meal for a healthy, gluten-free breakfast. Warm, melty gruyère and fresh asparagus star in these delicious open-face sandwiches. These amazing breakfast scones are ready in just 30 minutes. Fromage blanc gives this recipe its extra-creamy texture. When farmers' markets are in full swing, these are the perfect rhubarb-studded muffins.